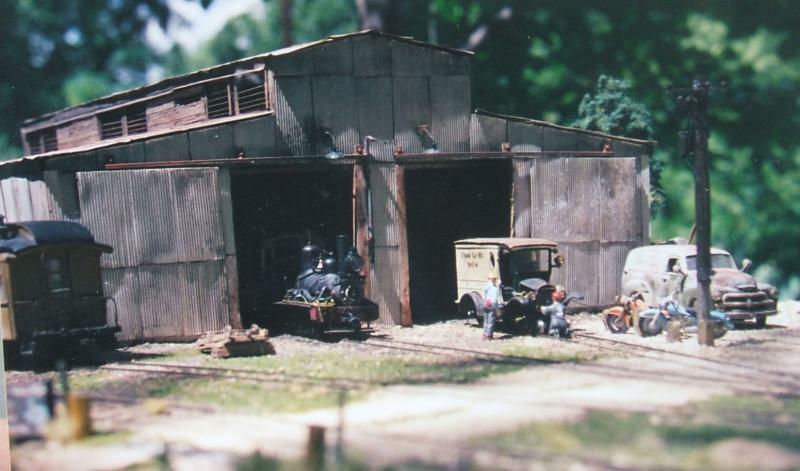 Here are a couple of photos I found of a diorama I built many years ago. The Cedar Tap RR ran in Central Texas, Lometa to Bend, in the early part of the 1900's. 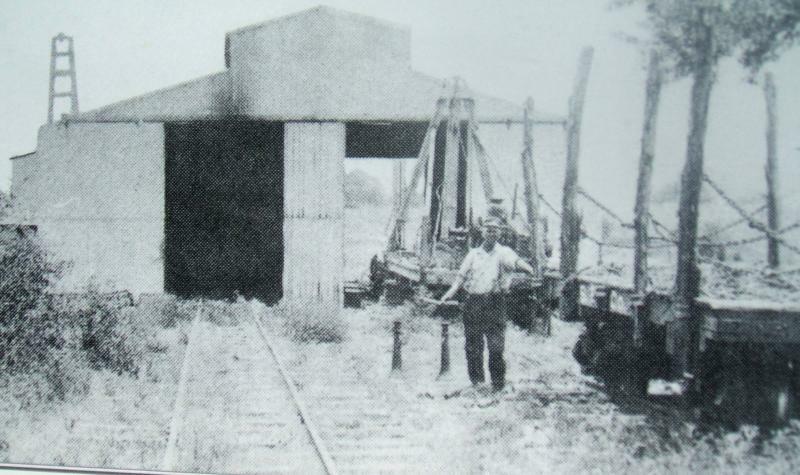 The little line was a 3 footer and hauled cedar posts from the breaks to the interchange at Lometa and the Santa Fe RR. There are very few photos of the railroad, none of it's only loco-a 26 ton Shay. And this old photo of the 60' by 80' shops with the master mechanic and a flat car is the only one showing any of the equipment. Note the derrick car behind the flat and the screw jacks near the "boss"
Here's my O scale model of the shops. This was probably one of the most intricate models I have ever built, it had full interior framing and was sheathed with "corrugated tin" that I made from cookie pan aluminum sheets. I estimated that there was 13,000 sq ft (O scale) of this corrugated. The doors worked, there were lights inside, and the interior was detailed with machinery powered by overhead belts. I used a shop inventory (insurance) to help decide what to use. And here is an HO scale model of the shops. As you may guess, I was totally bonkers about this building. 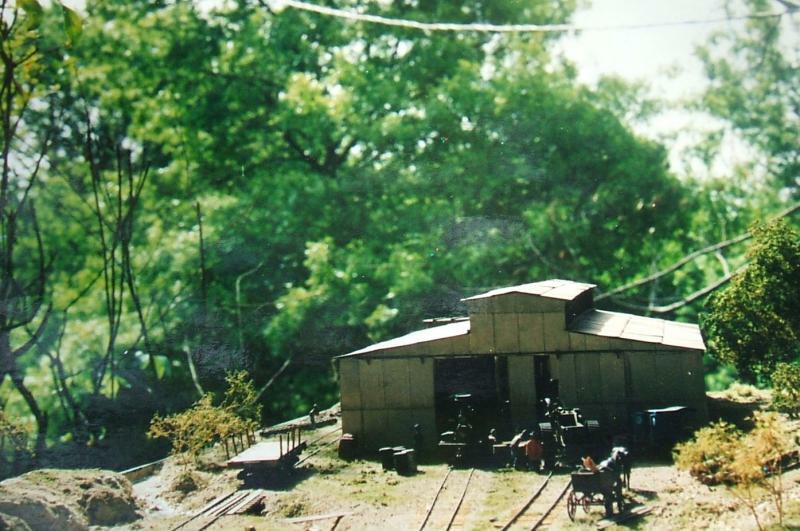 The O scale building is long gone now but I still have this HO diorama. Looking back, I recall that it was the building of these structures that was the "kick", when they were done...I guess that I was done. The pleasure was in the process, not so much in the ending. Herb, there may be some interior shots. However, they would all be (as these were) shot with a 35MM film camera. If I find them, I will try to copy them here. Nice photos as well, can't beat the ol' 100,000,000 Watt bulb up ^^ there ! Any idea what the object above the left side of the proto-photos roof might be ? What's the vehicle on the far right of your 1/4" version ? Is that a Dodge something ? Us Brits. ... we know nuttin' ! Si, in the photo, I believe the structure is some sort of derrick. There is no explanation about it. The rail truck was built from a 1:43 "Model T" and was powered with a Grandt Micro-Mo and toy car r/c board. That was one of my first r/c "experiments" and when I took it to a local "club", they didn't want me to run it on their layout because they believed that the r/c would screw up their funky DCC crap. The car's motor is now in the 35n2 Model T I have. You may be wondering about the GMC utility truck, another 1:43 die cast model, still around in a box somewhere. Very nice twice. How did you weather the aluminum? It looks really galvanized. Howdy Steven, the alum. corrugated was just sprayed with Testor's DULLCOTE and it did the job. I have never used the "traditional" etching solutions since I might get that all over the floor and me so I tend to distress the corrugated with a wire brush in a moto tool and then some rust paint or chalk. Todd, I lived through the shop fetish and anyways, N scale is way, way too little for me. Matter of fact, HO is that way now too...eyes going south!